Once again, I'm sharing the RAWs posted by Comiczip.net, not my own scans. I just got my own copy of the magazine today, but since these are scanned already... I'll save myself some time :D Credit for these RAWs goes to Comiczip, but the summary is my work. This chapter was pretty simple and strait-forward, without much development, but with a LOT of really cute and fluffy parts! It picks up where Chapter 76 left off, with Akane crying because she tripped and fell, Aoi watching, unsure what to do, and Matsunaga-san also watching, wondering if he should step in or try and let them work it out by themselves. Just as Matsunaga-san's about to step in, Aoi squats down next to Akane and asks "What about the Ketchup...? Shiharu-tan said there's no Ketchup for Omuraisu..."At his words, Akane wipes away her tears and says that she'll go to the convenience store, after all, and the two of them head off, hand in hand. After a bit more meandering, the two arrive safely at the convenience store. The staff there recognizes them instantly as the twins that Shiharu warned her would come to run an errand. Although Akane is singing "Ketchup, ketchup~~" when she enters the store, she very quickly gets distracts by "SNACKS!!!" Aoi asks dryly "What about ketchup...?" but then he too is distracted by Cosmo Ranger playing cards. Matsunaga-san, waiting outside, is also indigent (he and Aoi are so much alike, it's cute!) mentally ordering them not to get distracted and go get the ketchup. Luckily the cashier saves the day, getting the twins back on track by praising them for running an errand alone, and asking them what they came to get. Then the twins both make horrified faces as they remember the ketchup, and the cashier leads them to the shelf where ketchup is displayed. The twins pick one out and pay for it with a 500 yen coin. When the cashier gives them their change, the twins are amazed that the amount of money INCREASED after buying something. It's really cute, because they misunderstand that more coins = more money, not realizing that the coins they have now are *worth* less than the one they paid with. The cashier and Matsunaga-san, watching from outside, laugh at this, and then the twins wave "Bye B--ye!" and leave, each carrying one handle of the bag. After they're gone, Matsunaga-san steps into the store quickly to thank the cashier. The twins chat as they walk home, and suddenly Akane's stomach starts to grumble from hunger. Aoi pulls out the senbei (flavored rice crackers) Shiharu gave them before they left, and the twins sit down right there on the sidewalk to eat, much to Matsunaga-san's chagrin. Aoi is distracted by some "Peep-peep"s (birds) and accidentally drops his crackers. He gets depressed, because they are the senbei Shiharu gave him and he didn't even get to take a single bite before dropping them. Akane considers a minute, and then offers him her last senbei, since she already ate one. Matsunaga-san, still watching, is surprised and impressed by how mature this gesture is for normally selfish Akane. Back at home, Shiharu's reading Matsunaga-san's text message "They're just leaving the convenience store now" and worrying, because the message arrived 20 minutes ago and the twins should be back by now. Shiharu is fighting her maternal instincts to go look for them with all her might, when the twins finally arrive home. 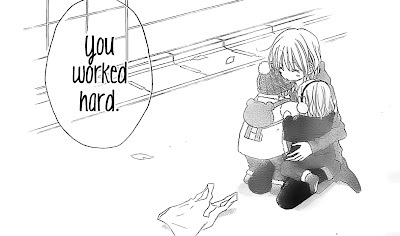 Akane immediately runs into Shiharu's arms, but Aoi hangs back. Shiharu tells them both "Welcome home!" and then, seeing Aoi's being reluctant, she holds out her free arm to him and tells him "Aoi-kun, you come here too! You've worked hard!" Akane and Shiharu both look on as Aoi's eyes tear up, and then he also comes towards Shiharu, slowly, while dragging the bag with the ketchup in it. Shiharu hugs them both and acknowledges their hard work. Just then, Matsunaga-san "just happens" to come home, and while he's helping her wash her hands before eating, Akane brags to him that she went to run an errand. As she's about to put her hands in the water, Akane remembers that she fell and hurt herself earlier, and runs to tell Shiharu about it with tears in her eyes. Shiharu has Akane wash her hands and then puts a bandaid on the scrape. Then she makes cute designs on their omuraisu with ketchup, while thinking that the twins are one by one progressing through all of their "firsts," slowly but steadily. The twins say "Thanks for the food!" and begin to eat. In the last panel it shows the twins' "Errand Card"s, a bingo-card like chart Shiharu made so they can collect a sticker each time they go to run an errand for her. The cards are already almost half full. The next chapter will be released in 8/5, my birthday! Come on, Matsunga X Shiharu <3 romance <3 ! Now, for next time, is it going to be about Sei-chan's birthday (and hence romance! =3) or a grandparents chapter? I feel like it's time for romance but if that's the case too long would have passed and it would be time for the kids to go already. omg this manga is too much cute!! !